Yeah, you read that right-- today I'm interviewing myself! I realized that, unless you follow my personal accounts and stuff, then there are a lot of holes in what I've shared on here. I really enjoy knowing more about the folks I follow, so I hope you all enjoy this, and I hope y'all will share about yourselves, too. A couple friends asked questions via Instagram, too, so those answers will be part of what I write. 1) Tell us a little about yourself-- your family, your creative background, your other interests, etc. I'm 25, a wife, and a mother of two boys two and under. Hubster (John) and I have been married for almost four years-- we got married a few weeks after he finished college and a year before I did. For undergrad I studied English, Secondary Education, and Linguistics, and I knit my way through many of my classes. Jemsy was born about seven months after I graduated. He's two and very wholehearted-- sometimes that means broken dishes and sometimes that means bear hugs. He has a contagious laugh, the funniest and cutest little run I've ever seen, and I'm convinced he has a future in contemporary art. Ian turns one next month. He is a shockingly happy baby. While Jem has boundless energy for all things explorative and reckless, Ian would rather cuddle and giggle. We just bought a house before Christmas, and it's marvelous. I'm an only child, and we live about 20 minutes from my parents. We love spending time together, and if we don't see each other for more than a day or two, Jem gets pretty antsy to see Papa Jim and Mama Deb. Growing up, I was always creative. I drew, painted, danced, and spent close to a decade as an obsessive knitter. I love the color and movement of painting, but the textile dimensionality of knitting. I think quilting has married those two loves. My years of painting (primarily with watercolors and oils) strongly influence my quilting. In addition to creative pursuits, I enjoy being outside (especially walking/hiking and cycling), visiting art museums, cooking, and hanging out in Downtown Duluth. Basically, I'm always game for an adventure! 2) (from @AmyJoDubya) What started you quilting? When did you start? How did you learn? Great questions! My first quilts were in the Summer of 2015. My mama had a whole bunch of cool tshirts from church events and traveling and was interested in a tshirt quilt, but the only lady we knew who did them locally was pretty pricey. I found a tutorial online for a rag style tshirt quilt, and my mom was brave enough to let me take scissors to her shirts. I made a small quilt for Jem to practice, then started on Mom's. I used a regular metal ruler and rotary cutter on my coffee table to cut squares and rectangles from Mom's shirts and a nice chunk from my finger. I didn't know then that I needed special rulers! I set up a handmedown Kenmore machine at my desk and made my first tshirt quilt. It took FOREVER. But there have been a whole lot of them since! I think it was about 8 months later when I started experimenting with "real" quilt things like sashing and batting, though I was still working with flannel because that's what I had from all the tshirt quilts. Later in Spring 2016 I used some craft store cotton I had tucked away from who knows what. I had read just about every quilting book at our library, but I also thought piecing looked horribly boring. But Angela Walter's quilting had me totally fascinated. I needed to piece a quilt so that I could try to quilt it. I was making pinwheels one Saturday when Hubster asked what I was up to-- and he still loves to tease me because he knew I would jump down the rabbit hole of quilting long before I admitted it. In May, the lady who was my middle school principal at a small local private school was diagnosed with brain cancer. 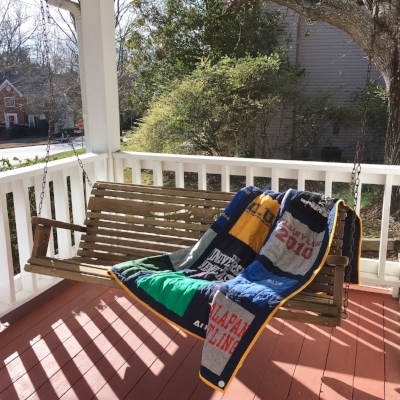 I jumped in with both feet to make her a chemo quilt and saw firsthand the way a project like that gathered community around a common cause and the way quilts are an almost mystical vessel for love. By last summer I was pretty serious about "real" quilting as well as my tshirt quilts. They're very different, but they both tell stories-- one like a piece of art and the other like a family photo album. Both are valuable and meaningful, but one appeals to a broader experience while the other is intensely personal. I enjoy both types of quilting because I want to tell all the stories! 3) (From @vicki49735) What is the most difficult part of making quilts for you? Basting. I hate basting. The hardest part physically is quilting because my machine doesn't have a very big throat space, but I just hate basting so I have to work up to it mentally. And, for what it's worth, my favorite part of any quilt is color. 4) How is creative community important to your work? Oh man, where do I start? Since those first books from the library, I've learned everything from my online community. I love creative podcasts, engaging on Instagram and Facebook, and even replying to my favorite newsletters from time to time. Most recently, as I've launched Quilts for Cure, I've been amazed and excited by the generosity of quilters across the country. I love my community! 5) What advice do you have for other makers along their creative journey? Show up. Make something every day, even if it's just a little something. I started going to my sewing room every night last summer, and building that habit has been a game changer. Instead of twiddling my thumbs waiting for inspiration, I always have lots of ideas and enjoy having the time blocked out to work on them. Also, take advantage of all the amazing free resources available, especially podcasts. I recommend them particularly because you can listen while you drive, clean house, or work in your studio. It makes me feel like I'm doubling my time to be learning and practicing at the same time. Ta-da! I hope y'all enjoyed that-- it's kind of funny to write about myself but also fun to share a bit more. If you have questions I didn't answer then leave them in the comments! If we haven't already, I'd love to connect @stringandstory on Facebook and Instagram. And if you have favorite makers you'd like me to interview for FriYAY Friends, please let me know! I'd love to connect with them too. Finally, graduations will be here before we know it, and tshirt quilts make amazing gifts. It's time to ask your grad to gather his or her favorite shirts!